Let’s just say that I am the kind of person who doesn't Really like going around the mall searching for the best deals that is why when I was First introduce to CHOIES I know its one online shop I will fall in love with and I am not wrong about it because aside from the fact that they offer FREE shipping worldwide their prices are very reasonable! And for someone like me who loves to go shopping I know with CHOIES my wallet won’t burn holes because they offer the best shopping deals online!!!! what's more is that Choies weekly stocked all kinds of trendy and stylish items and not to mention the fun activities and free clothes they give to their loyal fashionista patrons. So what are you waiting for? Get your fashion revelry started and start shopping at Choies! 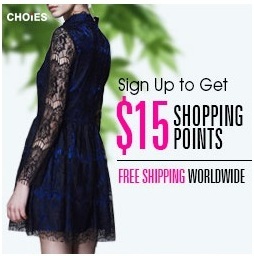 and here is another great deal by Choies they'll give you a $10.00 shopping points when you register at CHOIES and another $5.00 when you complete your personal information and by doing so you'll earn a total of $15.00 Shopping Points! amazing right? And Here's a sneak peek of what I got from the mail yesterday... Aren't they cute? Thank you CHOIES!!! So when you ask me what's my choice of online shop? CHOIES is my Choice.. The handbag its so adorable. sure, just followed you on GFC, bloglovin, Facebook and instagram! Hope you'll do the same ;) Kisses! We already followed you!! Do you follow us?? I never was order clothes from this website, I must change that. They have great dresses. Choies is one of my fav online shops , love the bag.. Thank's for dropping by at my blog by the way and leaving some comment. I followed you just now ^_^ Hopefully, You can follow me back so that we can keep in touch pretty! I invite you to join my first "giveaway" which is open internationally! Wow!!! Hearing it for the first time and thank you for sharing this. I just check them out and they are awesome. The feature for blogger is awesome. Will consider this. And by the way, the shades is just perfect. 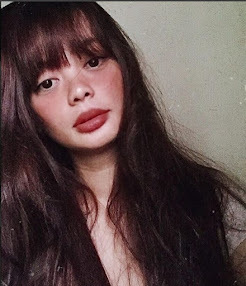 Vintage looks and love it. Hi lovely, thanks for sharing this super cool info! Also, thank you for leaving a comment on my blog :) I'm already following you on GFC so if you could follow back that would be amazing! very good blog I follow gfc as Judit Törtei. As I follow bloglovin Judit Törtei. Very good bag love it! Hello Nana! Thanks for sharing this website! This is really a great find. Btw, following you now on GFC and G+. Thanks for stopping by! Sure, we can follow each other! Follow me, I follow you! Thank you very much. Yes I would like to follow each other. I am following you now on GFC and bloglovin. Hope you'll do the same. Following you now, hope you'll do the same. i love to follow each other. Wow, I really love that bag, so adorable! Great review dear. Feel free to visit my blog and if you like, follow me. I'll follow you back ^_^ Maybe we can follow each other on Instagram as well.